Banzai Hale – Luxury Vacation Homes, Inc. 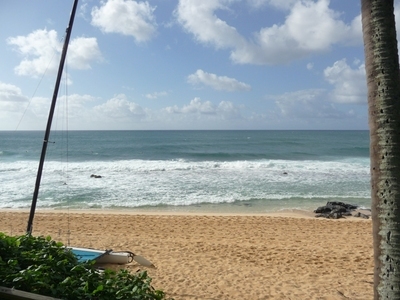 Directly beachfront at the famed Banzai Pipeline, this privacy-gated, 4 bedroom, 3 bath, two-story home features two covered oceanfront lanais and superb ocean views from the living and dining areas and from the master bedroom. The property is nicely decorated in whites and pastels; has new wood floors in the living/dining areas and carpet in the bedrooms and has a modern, well-equipped kitchen. 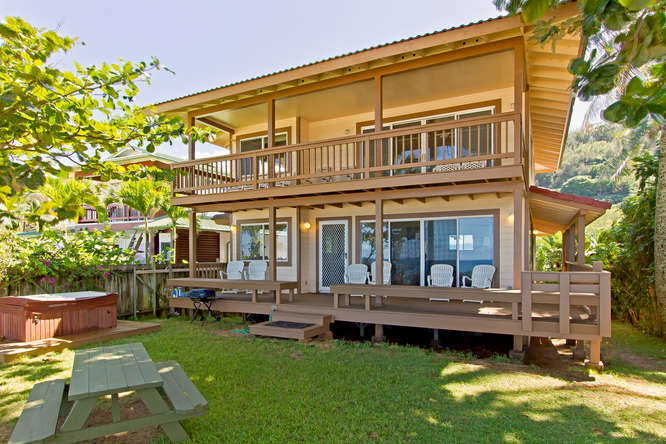 Relax watching the surf from the lanai or while soaking in the hot tub. This place will make everyone happy to be on vacation. In the November through March time period, the North Shore’s huge winter waves attract surfers from all over the world. The beach is not reef-protected and may become eroded in winter but returns with the calmer waters of spring and summer. The village of Haleiwa offers several dining choices, a variety of small shops and a number of art galleries. Restaurants, golf, tennis and horseback riding are available to non-hotel guests at the nearby Turtle Bay Resort. High surf in the winter season, and strong currents year-round, can make ocean swimming dangerous.